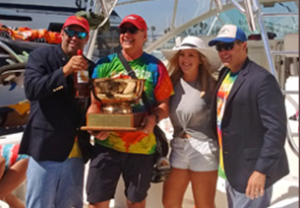 LONG BEACH, Calif.— Long Beach Yacht Club’s Mike Tande won the first-ever Soling Cup this past weekend, raced on LBYC’s fleet of 27-foot Soling sailboats as part of the club’s Intermediate member Long Dock Takeover Cruise. Racing in the Alamitos Bay Marina on a 2.5-nautical-mile course in 10-12 knots of breeze, the six skippers and crew wound in and around the marina from the beach on the peninsula to the 2nd Street Bridge. At the end, Tande beat second place finisher, Daniel Gorman by only one boat length. The other four skippers were Ian Paice, Jesse Feldberg, Matt Wise and Joel Buffa. One of the nuances that Tande might have been referring to was when the race committee asked several boats do penalty turns during the race, with some skippers not quite clear as to why they had to do the turn. But everyone complied and seemed to have an enjoyable time on the water. Race Committee was headed up by Principal Race Officer Alexis Hall, who was assisted by Staff Commodore John Busch, race chair Jeff Landers and Intermediate Long Dock Takeover Cruise chair Chris Macy.